The South Carolina competition challenges you to trap as much grits on your body as possible. Most cities roll out festivals highlighting their local culture. And in some ways, you can say St. George, South Carolina, did the same when it created the World Grits Festival. The small town has a population barely hovering above 2,000. But they claim to be the biggest consumer of grits, per capita, in the world. The claim was originally made in 1985 by Bill Hunter, the manager of the local Piggly Wiggly supermarket, after offhand comments from multiple suppliers suggested his tiny town was eating more of the cornmeal-based mixture than others. And the celebration was born. 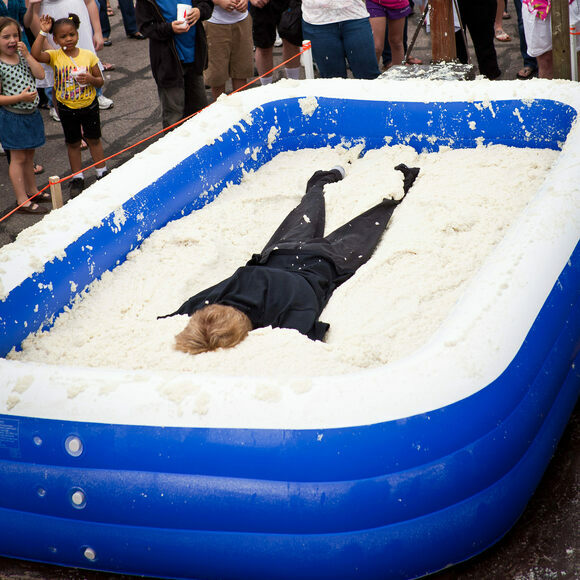 The three-day fest features all things grits, including the Rolling in the Grits contest. Contestants dive into a pool filled with 27 cases worth of the stuff and have 10 seconds to collect as much as they can on their bodies. Participants are weighed before and after their “swim,” and whoever comes out carrying the most grits wins. There are many approaches to maximum absorption: Most contestant duct tape their cuffs and sleeves shut for trapping grits inside, and some even wear backward-facing sweatshirts, scooping with their hoods. Perhaps Tiffany McGirr’s approach was best. Wearing extra-baggy pants hoisted up by suspenders, the 2015 champion collected a whopping 66 pounds of grits. If you decide to participate in the rolling in the grits contest, leave your jewelry at home and get creative with your dress. It’s not uncommon to see contestants wearing sweatpants and sweatshirts turned inside out to create a better magnet for the grits to cling to. The World Grits Festival takes place every April. The 2019 festival will occur on April 12, 13, and 14, with the rolling in the grits competition on Saturday, April 13. These spud showdowns are highly-anticipated events at tuber-focused festivals in the United States.